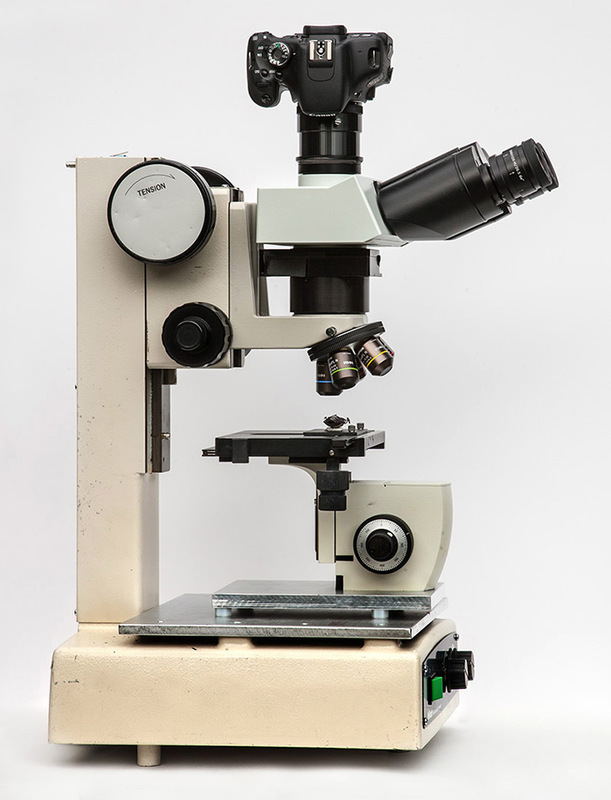 In a recent post I had Rik a little stumped as to how I maintained my sanity working with three objectives having three very different parfocal distances (Olympus:45mm, Nikon:60mm and Mitutoyo:95mm) on the same microscope. 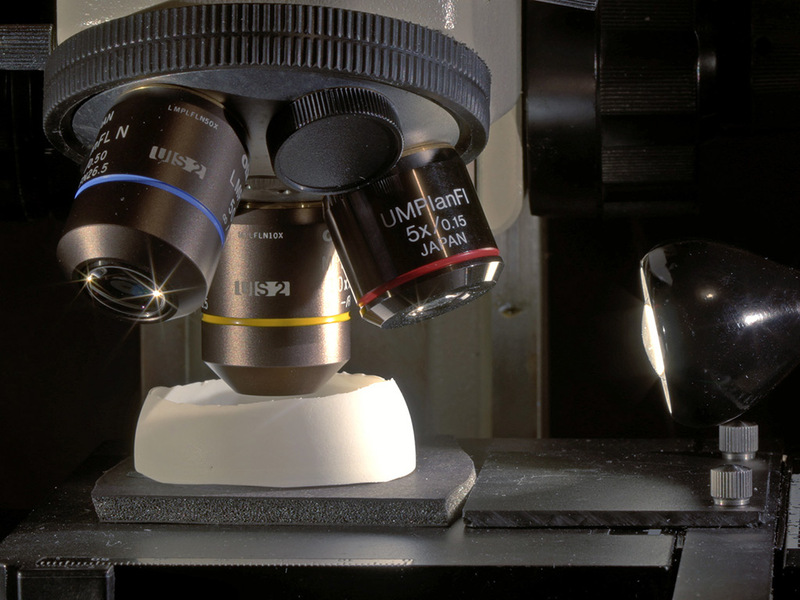 It's pretty easy to understand once you see how the Nikon MM-11 microscope is made. The key is the very substantial and lengthy 3rd focus movement on the pillar upright (the big knob in the pictures below). While this is still a "work-in-progress" it is quite functional and a real pleasure to use. It is outfitted with an Olympus U-TLU (180mm tube lens unit) and an Olympus U-TMAD (hollow adapter that takes a regular T-mount). The upper Olympus dovetail mount is a little smaller than the Nikon one, so I was able to shim it up a little to attach and center the Olympus pieces on the Nikon stand. I've got some nifty plans to change this upper arrangement but this will do for the time being. The only frustration is that the camera can't be readily rotated.. but that will be remedied! The only frustration is that the camera can't be readily rotated.. but that will be remedied! In the second picture I recognise a focusing block from a Zeiss Standard (inverted?). A Zeiss rotatable stage widely available may prevent the need to rotate the camera. Good eye!... yes that is an old Zeiss stage/focus mechanism. I have made up a variety of top "plates" that I attach via the two thumbscrews that normally hold the slide "fingers". One includes a rotating platform. It is nice as long as you establish the orientation before you establish the lighting effect. If the lighting has already been established, and you then decide you need to re-orient (rotate) the subject it can change the lighting effect as seen of the subject. In this case a rotating camera is better. Eventually I would like to have both options. I've been very pleased with the rotating mechanism made up from 2 inch "astonomy" visual backs on my BH2. So as you suggest, I'll do something similar here. Instead of the U-TLU I want to put an Olympus super-widefield trinocular head on top with direct projection onto a "rotatable" APS-C body. As nice as it is to use live-view on the camera LCD or an external monitor, I still prefer viewing a subject through a good pair of eyepieces, especially when "scouting" a subject for a good picture. - If the U-TV1X + U-TMAD + T adapter put the camera sensor at the 180mm from the tube lens, I am asking for parfocal when a trinocular head is used? - If the U-TV1X allows for the upper parts to rotate (rotate the camera) or the upper parts can not be rotate because the U-TV1X is used to set the system parfocal (moving the upper part up/down inside the U-TV1x until it is parfocal)? 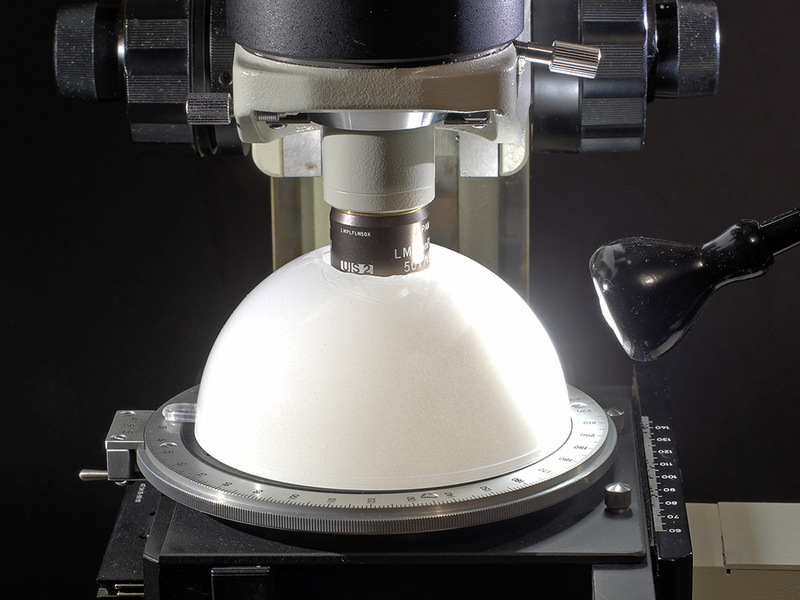 You can consider the top of the U-TLU to be the same as the top of a BX trinocular head (same female 42mm dovetail mount, same distance requirements for added optical components). In a set-up the U-TLU would take the place of a viewing trinocular head. The U-TV1X has the male 42mm dovetail on the bottom, and that attaches to the top of the U-TLU or a trinocular head, where it is locked in place with a set screw. The inside upper part of the U-TV1X has a long female thread (M56X2). The lower part of the T-MAD (as well as various other camera adapters... U-CMAD3, U-BMAD, U-SMAD) have a long male M56X2 thread at the bottom. This is screwed into the U-TV1X, and the threads provide a certain amount of up/down adjustment to achieve parfocality. It is then locked into place with a set screw. (No rotational capability at this connection, to do so would obviously change the "parfocal" distance). A standard T-mount fits on top of the U-TMAD. So everything is "locked down" with set screws (except for the T-mount which is simply screwed onto the upper M42X0.75 threads as is normally done). There is no camera rotation capability built in. I suppose you could replace the set screw at the top of the trinocular head (or U-TLU) with a knob so you could loosen it by hand. That would allow you to rotate the camera as desired. 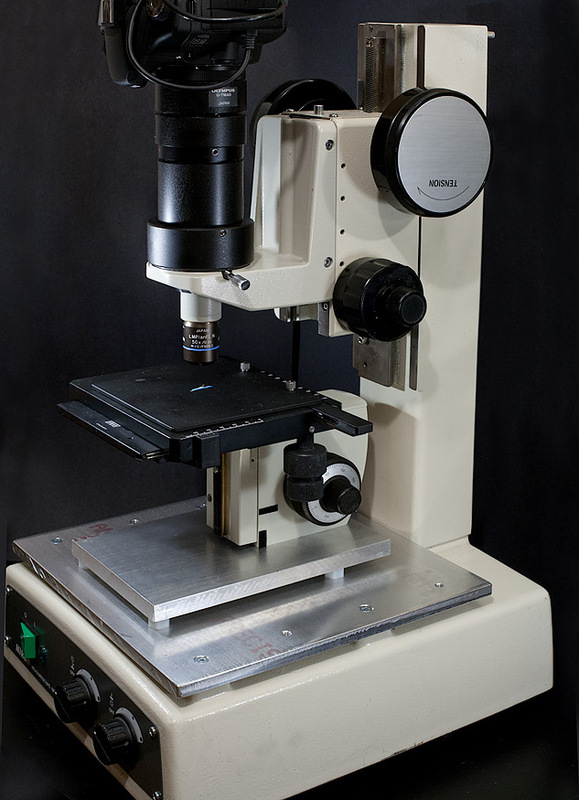 But that is a basic microscope dovetail mount, and as such was not intended for regular rotational usage. If the need to switch camera orientation is not very frequent it might be a solution. But if you are constantly changing the camera angle regularly it does not seem like a good idea. Whenever I get around to it I intend to make up an upper piece made up of some standard "astronomical" components as shown here. The U-TMAD has an (easily removed) thin flare-cut diaphragm inside at the top near the T-mount. The opening in this diaphragm is pretty small ~20mm, while the metal "through-hole is" about 34mm. With this diaphragm in place I would get vignetting in the corners of a Canon APS body. Removing it allowed full exposure to the corners. (After removing it, it could be seen that the inner surface machining was quite "shiny", so it was lined with the Protostar flocking material). Thank you very much for the description of how all Olympus components work, that really help me to undertand that components. Posted: Mon Jan 14, 2013 11:05 am Post subject: First non-Nikon component in the U-TLU stack? Your photos of the MM-11 adaptation are crisp and helpful, but I don't understand the larger-diameter component that you're showing at the bottom of your U-TLU / U-TV1X / U-TMAD / T-mount stack that actually attaches to the Nikon dovetail... Is this an Olympus part, or is this something you had made up? 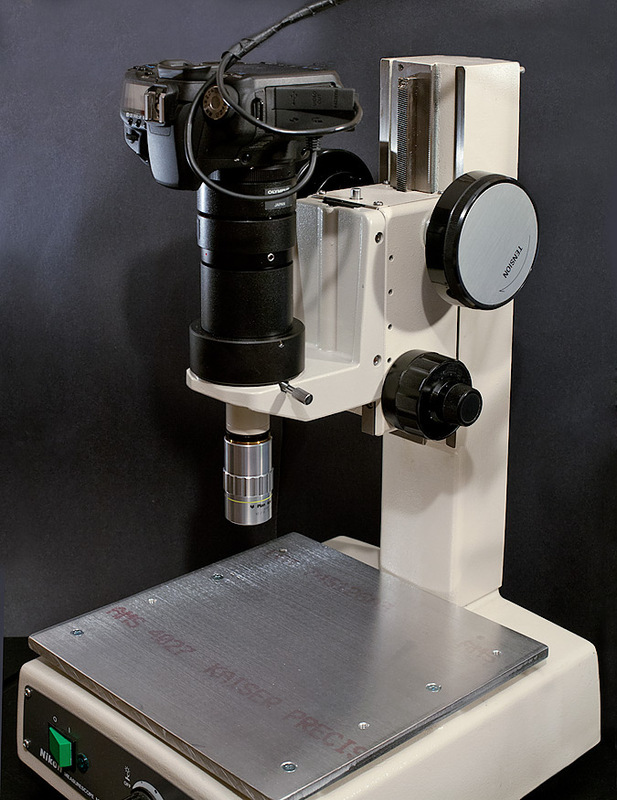 As an aside, for those who might be wishing to emulate this very stable set-up to make a vertical stacking rig, these Nikon toolmaker's microscope stands have been coming up on eBay rebranded as "ADE Phase Shift MicroXAM" units that were the basis for a special-purpose surface profiler. It's pretty straightforward to return them to a more stock Nikon spec and appearance. Three days ago a complete example sold for 102.50! That is a simple hollow Olympus tube (U-EPA) that is normally used to raise the viewing head if needed for more comfortable observation. It is not necessary here. The reason I did include it is that I do not have a Nikon stand to Olympus BX adapter. The Nikon female dovetail on the microscope is larger, so I needed to attach some shims to the Olympus dovetail to get a tight, centered fit. I already had a couple of these inexpensive U-EPA tubes, so I decided to work on the dovetail on one of these rather than possibly mess up the dovetail at the bottom of the much more expensive U-TLU component. Posted: Mon Jan 14, 2013 3:05 pm Post subject: That makes sense when you're winging it! For some time now this MM-11 has been completed the way I had initially intended (mostly... one is never really done tweaking these things ). These pictures are to update the project. The big change from the initial pictures is the replacement of the Olympus U-TLU tube lens and the Olympus U-TV1X adapter. In their place an Olympus U-SWTR-3 super-widefield trinocular head was added. (The 180mm tube lens is built into this head). On top of the trinocular head a camera adapter was made up from "astronomical" components. This adapter allows for smooth 360 degree camera rotation, and was made so that the camera is parfocal with the viewing eyepieces. The eyepieces on this trinocular head have a field number of 26.5 mm. The diagonal of the Canon sensor I use is 27.3mm so the "fit" is pretty good. The round "spacer" under the Leeds part allows me to go from Nikon dovetail to the Olympus BX dovetail. This is the 5 place RMS nosepiece (Nikon) with some Olympus MPLFLN objectives. Sometimes I will only use two or three objectives in the turret if I need more room to work with certain diffusers or reflectors. There is also the single place nosepiece that can be used with the Olympus or Mitutoyo (with RMS adapter). If I know exactly what I am after and do not need to survey the subject at different magnifications this nosepiece allows the most freedom and clearance for diffusers, reflectors and lighting. A number of the items from the catalogue which you linked are available at reduced prices from Leeds from their Demo and Overstock list at www.leedsmicro.com/demosale22014.pdf. 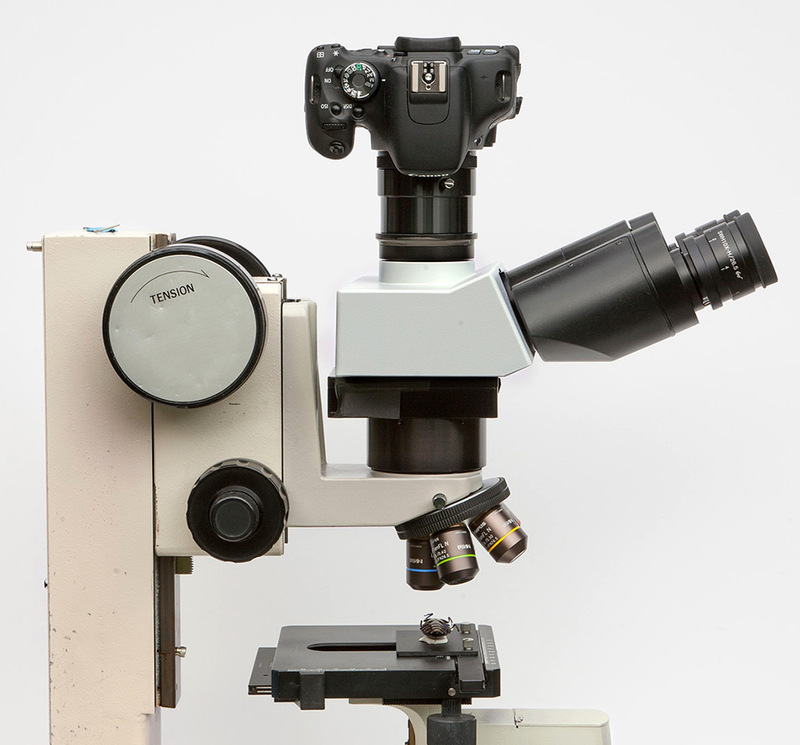 Wow!, now this is a true compound microscope. Clever adaptation! Just one question, do you use the fine focus of the Nikon or of the Zeiss base for stacking?